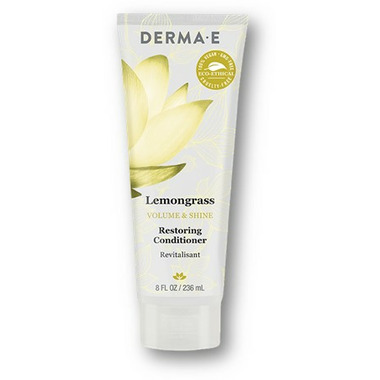 The Derma E Volume Shine Restoring Conditioner combines potent natural antioxidants, vitamins and botanicals to strengthen, smooth and moisturize your hair. It harnesses nature’s most effective ingredients to give you lustrous locks. Water, Caprylic/Capric Triglyceride (Vegetable Derived), Cetyl Alcohol (Plant Derived), Brassicyl Isoleucinate Esylate (Plant Derived), Brassica Alcohol (Plant Derived), Glycerin (Vegetable Derived), Arginine, Hydrolyzed Quinoa, Arnica Montana Flower Extract, Tocopherol (Vitamin E), Helianthus Annuus (Sunflower) Seed Oil, Panthenol (Provitamin B5), Phenoxyethanol, Ethylhexylglycerin, Cymbopogon Schoenanthus (West Indian Lemongrass) Oil, Cymbopogon Martini (Palmarosa) Oil, Natural Fragrance Oils. Smells like fruit loops & it works for my pin straight heavy thick long hair & my kids curly knotty hair without buildup! Lasts for days!